If you by mistake set the ignition to 7 mm. BTDC, will you get the result you can see on the photo below. If you have set the ignition to 6 mm. 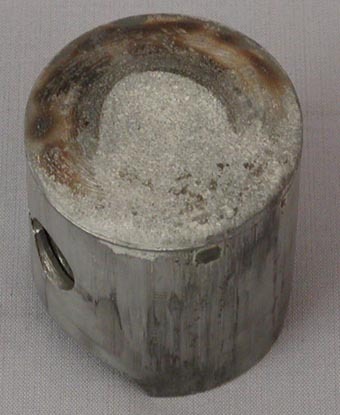 BTDC and have a small melting in the middle of the piston, then reduce the ignition timing to 5.5 mm. BTDC, because then is the marking on the ignition stator and rotor not 100 % correct. 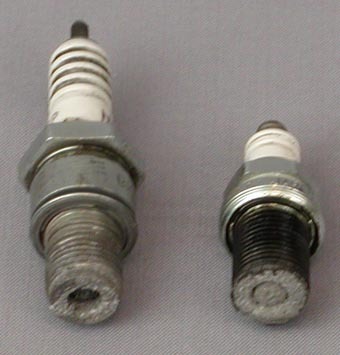 Then you have to high ignition timing, (as you can see on this photo), then it doesn't matter about you use a 10 or a 11 spark plug, in both case is the electrode burned away, and then melted aluminum is in the combustion camber, and on the spark plug.